William Bickett was born about October 30, 1891, in Xenia, Xenia Twp., Greene Co., OH, and died November 8, 1892, in Xenia, Xenia Twp., Greene Co., OH, at age 1. Buried in Woodland Cemetery, Xenia Twp., Greene Co., OH. He is the son of George McVey Bickett of Xenia Twp., Greene Co., OH, and Ruth Elizabeth Simons of Clark Co., OH. 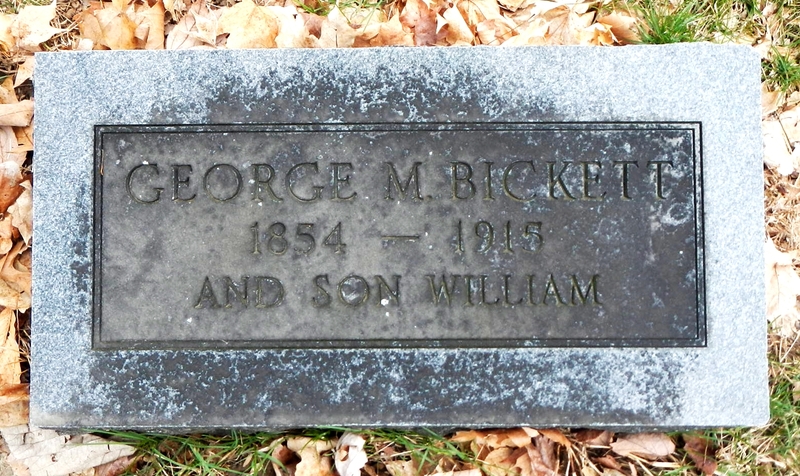 George McVey Bickett and William Bickett are buried in Woodland Cemetery, Xenia Twp., Greene Co., OH. Thanks to Find-A-Grave for making this image available. The 1880 U. S. Census taken on June 9, 1880, shows George Bickett (age 28) born in Ohio to Ohio-born parents is a Plumber and is living on Hinling Street, 3rd Ward, City of Xenia, Xenia Twp., Greene Co., OH. Living with him is his wife, Elizabeth Bickett (age 27) born in Ohio to Ohio-born parents. Also living there are his children, all born in Ohio: Arnold Bickett (age 4); and Maud Bickett (age 2). Also living there is a boarder, William Simons (age 25), a Coal Merchant. Leigh Larson note: William Simons is the brother of Ruth Elizabeth (Simons) Bickett. William Bickett was born about October 30, 1891, in Xenia, Xenia Twp., Greene Co., OH. Mr. and Mrs. George Bickett, of Spring Hill, have welcomed a young son to their home. Mr. George Bickett, of Spring Hill, left this morning for Paxton, Ford Co., ll., to attend his father and mother's golden wedding. He took his two youngest children with him. 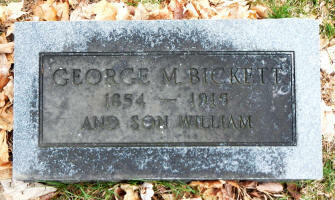 William Bickett died November 8, 1892, in Xenia, Xenia Twp., Greene Co., OH, at age 1. Buried in Woodland Cemetery, Xenia Twp., Greene Co., OH. The year-old son of Mr. and Mrs. Geo. Bickett, of Spring Hill, died last night of membraneous croup. The funeral will occur from the house tomorrow afternoon at half-past one o'clock. Leigh Larson note: Membranous Croup is an old name for a disease that is now known as Hoarse Cough or Diphtheria, a contagious disease of the throat.